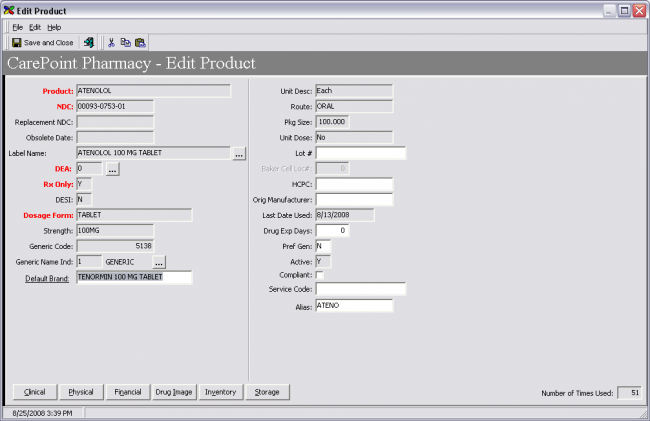 The GuardianRx Dispensing module can automatically make generic for brand drug substitutions when moving from the Prescription window to the Dispense window. There are several items that need to be set up for this substitution to occur automatically, the most important of which is having tied a generic drug to a brand drug for which you would like to have the substitution occur, and also flagging a particular generic drug as the “preferred generic,” since multiple generic drugs can be tied to one brand drug. To tie a generic drug to a brand, note the Default Brand field at the bottom left hand corner of the Edit Product window for the generic drug. Simply type the name or eleven digit NDC of the brand drug to which you want to create the link and tab off the field. A Find Drug window will be displayed that allows you to pick the drug to which you wish to link. If this generic is to be the product that you would like to use as the substitute, be sure to set the Preferred Generic field to “Y”. When entering the Rx, once you click Dispense, depending upon your settings when to display the drug find, it may appear with options to choose which generic, simply hit the escape button and the preferred generic drops into the Product Dispensed field. The Preferred Generic function is Inventory specific, not store specific. If an item is marked as a Preferred Generic and is not in your inventory it will default to the Product Written. When you dispense it will default to the product selected as the Preferred Generic (you will see it still drop in with the auto pop on the product dispensed, it shows you all NDC’s but the Preferred Generic NDC is in the background).